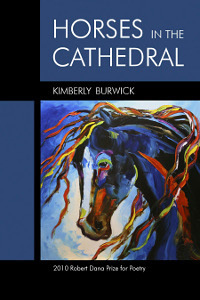 As part of my new routine of reading and writing each morning, yesterday I read this poem from Horses in the Cathedral, by Kimberly Burwick, a writer living in Moscow, Idaho. Despite its brevity, the poem is full, and well, lush. That first line is an immediate hook — I do not know the names of things — and the reverent details and tone transported me easily from the poem to my journal. Energized, I lifted a line — a lot of God blooming into vines — and started a freewrite. This prompt produced pages of material. Later, I reread the poem and realized it was not a lot of God but the lot of God. But no matter, whatever unfurls the mind and moves the pen. On this Thankful Thursday, I am thankful for poems that arrive and energize.